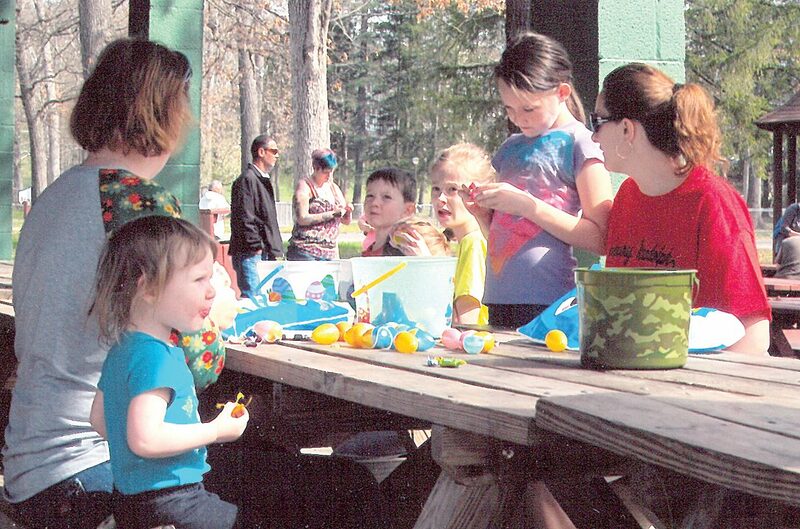 The Inter-Mountain photos by Shannon Bennett Campbell Children at Elkins City Park have almost as much fun counting eggs as collecting them at the annual hunt. The ‘Bunny with the Money’ distributes as many hugs as dollars during the morning. 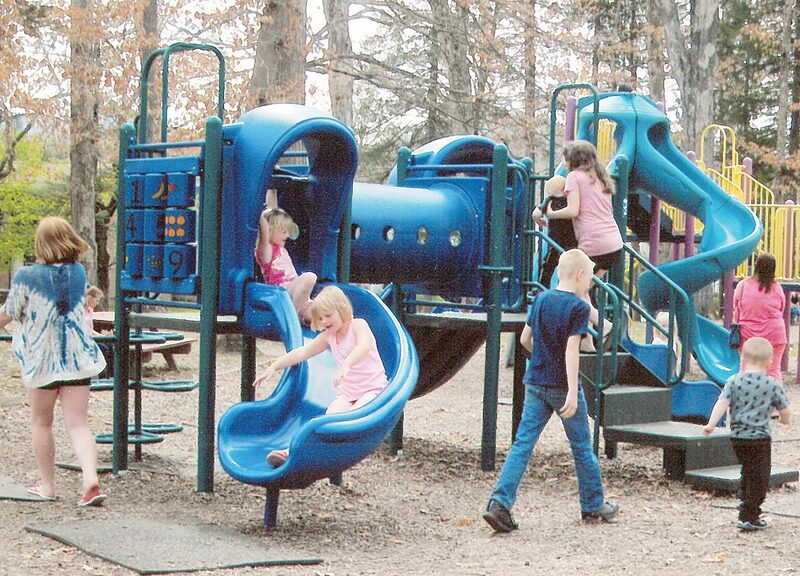 Children spend much of their Elkins City Park visit at the playground. As we begin to see some acceleration in our temperatures, we start to anticipate the welcome spring activities to which we always look forward. The appearance of bunnies, assorted flowers and faith pilgrimages take their places on our calendars and we search our closets for some lighter clothing. 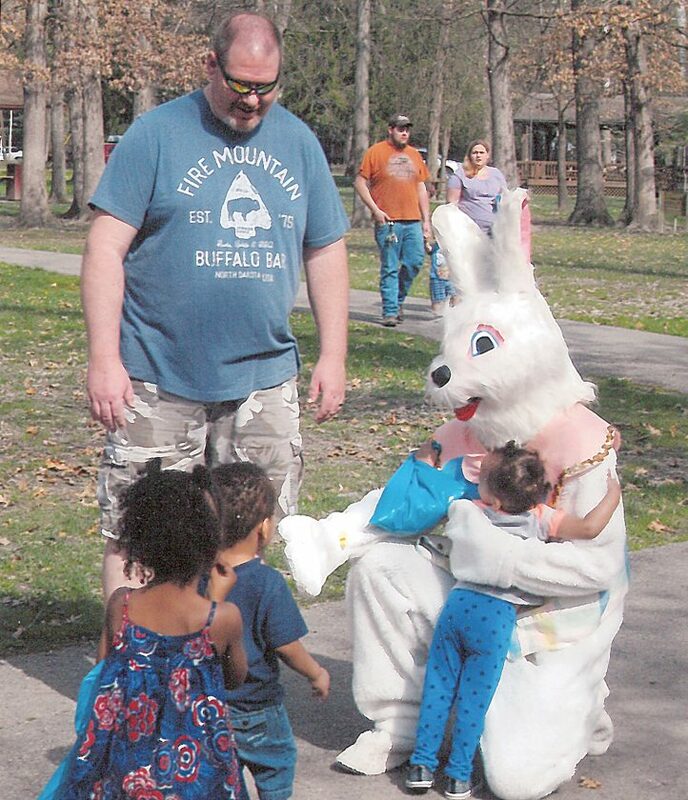 This year, WDNE radio celebrities will again make their mark on the Elkins City Park and reunite us with their annual egg hunt April 13 at 10 a.m. This is no small venture as the station employees will distribute 4,000 eggs around the park for excited children to find, according to coordinator Michelle Clark. Competition will take place in age groups and the “Bunny with the Money” will be there to make sure some of the eggs have dollar amounts. Every year, an estimated 200 children bring their parents to watch them scour the park with containers to collect eggs. Much play can also take place on the assortment of recreational swings and sliding boards, so it is quite a pleasant morning for all involved. As one travels through this valley and others in surrounding areas, springtime’s new growth is apparent and many beautiful flowers are popping through the soil to add color and landscape. We can only hope the weather will cooperate and limit the frost’s affect on the budding bushes. Last year the lilacs were victims and many missed the wonderful aroma of that fragrant flower because of a late temperature below 30 degrees. Our Christian population is preparing for their magnificent Easter services, which capture the essence of re-birth. Christ’s appearance after death on the cross is a symbol of the miracles only God can do. The fact that so many throughout Appalachia celebrate this religious event attributes mightily to the faith that is prevalent among our people. As spring becomes such a popular time for celebration, let us give thanks that we can enjoy egg hunts, floral beauty and religious freedom. Let us travel in this countryside among those we call family and know that while others are enjoying springtime too, it is probably a little more special on our side of the mountains.